Anyone who’s watched CSI or similar shows knows that, whenever the investigating team are on the scene of a gruesome and bloody murder, luminol solution gets sprayed liberally over absolutely everything. The result is a pale blue luminescence whenever the solution meets blood, which itself is a consequence of a chemical reaction that the blood gives a helping hand to. Here, we look at this reaction – and what horseradish has to do with it. Luminol, known chemically as 5-Amino-2,3-dihydro-1,4-phthalazinedione, isn’t used in the CSI’s mysterious spray bottle on its own. It’s joined by a number of other chemicals which are just as vital for the reaction to take place. The first of these additions is a strong oxidising agent such as hydrogen peroxide; this chemical is directly involved in the reaction with luminol. What’s also needed is a basic solution, which can be achieved via addition of an alkali such as sodium hydroxide. This is necessary because, in neutral solution, luminol forms what’s known as a zwitterionic structure; that is, a molecule with both a positive and a negative charge. In a basic solution, it forms an anion, a negatively charged molecule which can be oxidised by the oxidising agent. This isn’t all that’s required, however. The reaction also needs a catalyst in order for it to proceed, and this is where blood comes in. Blood contains haemoglobin, which contains iron atoms. These iron atoms can act as a catalyst for the reaction between luminol and hydrogen peroxide, allowing it to proceed. A cyclic peroxide is produced by the reaction, which quickly decomposes to give a chemical called 3-aminophthalate. The reaction releases energy, which is transferred to electrons in the 3-aminophthalate molecules, promoting them to a higher energy level. As the electrons drop down to a more stable energy level, they release their excess energy as photons of light, resulting in blue chemiluminescence. Luminol can detect the presence of blood at dilutions of up to 1:1,000,000, or 1 part per million. So, blue glow from luminol always equals blood, right? Wrong! Unfortunately, there are several other substances that are capable of catalysing the oxidation of luminol. It can also be oxidised by the chemicals in bleach, such as sodium chlorate; low levels of blood in urine can also trigger the reaction. Additionally, enzymes can also lend a hand. Peroxidase enzymes found in faeces can set off the chemiluminescence, and, more strangely, horseradish also contains peroxidase enzymes that can cause a false positive. Admittedly, the likelihood of a crime scene having been smeared in horseradish is pretty low, but it illustrates some of the drawbacks of relying on luminol as a clear-cut indicator of the presence of blood. Luminol also has other disadvantages. The glow is much shorter-lived than sometimes portrayed in TV shows, and lasts only around thirty seconds. 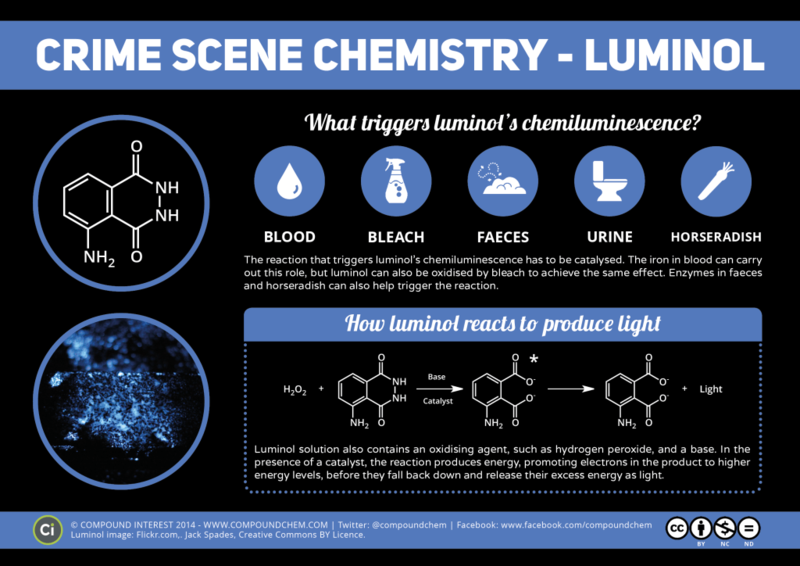 The use of luminol solution can also damage other surrounding evidence, such as proteins, enzymes and genetic markers, though it’s been shown that DNA samples can still be obtained from evidence on which luminol has been sprayed. As it’s water-based, it can also cause the dilution and smearing of blood impressions. So, whilst luminol is certainly an incredibly useful tool in the CSI arsenal, it’s probably not sprayed quite as liberally around crime scenes as television might have you believe. Next articleHas forensic science made it impossible to commit the perfect crime?